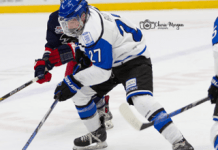 Red Deer, AB – Nicholas Sanders was stellar in his debut with the Prince Albert Raiders, but it wasn’t enough on Saturday night in Red Deer. Sanders made 32 saves during his first start with Prince Albert, but the Raiders fell 3-1 at the Enmax Centrium. Following a scoreless first period, the Rebels got on the board right after a Raiders’ power play. Michael Spacek stepped out of the penalty box and had a clear breakaway on Sanders. The Rebels import made no mistake and beat Sanders at the 3:32 mark of the second stanza. Later in the period, Josh Mahura set up Brandon Hagel with a backdoor pass, making it a 2-0 game after 40 minutes. Captain Tim Vanstone sparked the Raiders’ offence in the third period. He tipped home a point shot from Vojtech Budik on the power play at the 5:49 mark of the frame. The Raiders buzzed for the remainder of the game, but were unable to find the equalizer. Luke Coleman had the best chance with under a minute left, but slid the puck just wide. Red Deer came the other way and Mahura was the beneficiary of a patient play by Hagel and beat Sanders to make it a 3-1 game. Lasse Peterson made 29 saves in the win for the Rebels, with most of his toughest action coming in the third period. The Raiders close out their Alberta road trip on Sunday afternoon when they visit the Calgary Hitmen at the Scotiabank Saddledome for a matinee. Puck drop is 4 p.m. The Raiders return to the Art Hauser Centre on Friday, October 28 against the Spokane Chiefs.